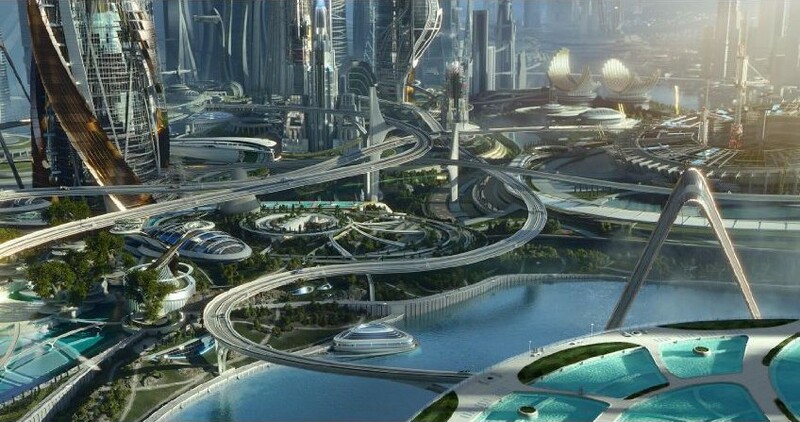 Tomorrowland, a lavishly gorgeous and incredibly realized world, had that above quote tattooed all over its underlying smarmy self. Be happy, be positive, believe in humanity. This is not a story. It’s a boring lecture, and one given by the kind of self-righteous and omniscient instructor bound to thwack us with a yard stick every time we shake our heads or prove them wrong. I tried to enter the theater in my most childlike state, attempting to rekindle the sheer joy and sense of adventure from my Amblin Entertainment filled youth. And after the first ten minutes I sat there tired, dismayed, and cheated. Granted, this is a PG Disney blockbuster aimed at kids…except it isn’t really, besides the colorful frame and dazzling effects. Most children won’t understand or care about this story or its sometimes commendable purpose, which ironically disproves every goal it sets out to achieve. 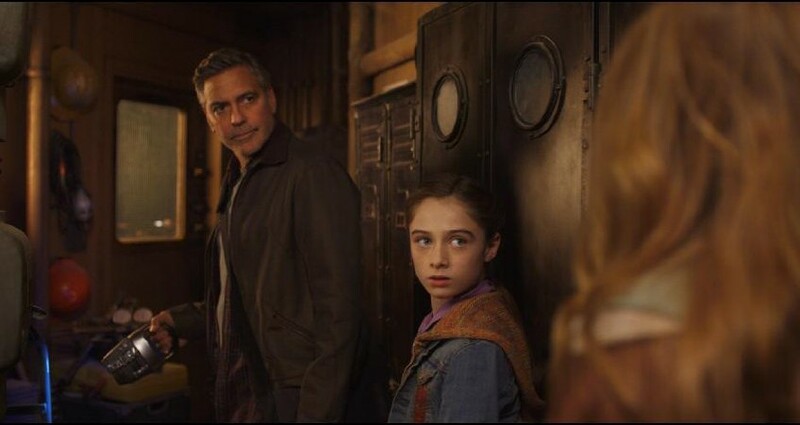 Tomorrowland bases itself entirely on a terrible metaphor of two disparate and battling wolves, preaching that we must feed the one with hope rather than the one with despair. Except by end this dies of gluttony, gorging on the same redundant theme over and over and over again. The movie is set up in a series of blocks. By doing so, no character firmly takes control of the narrative and leads the story. We start out with Frank Walker (George Clooney) speaking directly to us (or is he?) Frank says, “this is a story about the future, and the future can be scary.” He’s a crotchety and pessimistic old man, scorned in his childhood and devoid of hope. You see, Frank went to Tomorrowland as a child, a genius little inventor with a twinkle in his eye and a heart made of gold. But then he was banished for life – for reasons that are literally never explained – and holes up in his off the tracks and booby-trapped New York home waiting for the end of the world. And then there is Casey Newton (Britt Robertson). She’s young, pretty, headstrong and brilliant. Casey is inundated at school by the world’s problems: famine, war, disease, hunger, death. And she spins the simple topics of discussion on their heads. “What can we do to change it?” or “How do we fix it?” But in this world, the adults have all grown to be cynics and empty wells of hope. Casey is meant to be the bastion, the savior and the light to steer humanity’s growing sense of grim away from the darkness. She thwarts attempts to tear down the launch pad at Cape Canaveral and is so darn positive that you are almost swayed onto her side. It’s nice to see. Rarely do we get a female character, even in a Disney movie, who has no need for a boy to sweep her off of her feet or stir up romance. Casey makes science and learning attractive for young girls out there to see, and that’s probably the highest selling point of the entire film. Which also explains why I was so letdown by the use of her character. Director Brad Bird and screenwriter Damon Lindelof do some massive world building in this feature. When we are whisked away to the magical city/metropolis/whatever Tomorrowland actually is, it’s truly something to behold. The design is impeccable and cleverly combines the obvious inspiration of Bird’s youth (the Jetsons could’ve lived here) while still keeping a foot firmly set in the contemporary. It’s a land of thrills and frills and no restraint on imagination. Oh how I wish they had done the same with the story. The trailer sold me on the look and not the context, mostly because after you’ve seen the whole movie you realize there hardly is any. Frank and Casey must get back to Tomorrowland, save the world or something and another, and live the good ol’ life happily ever after. It’s hunky dory, cloying, and trite. And I am saying that as someone who is the furthest thing from a pessimist. 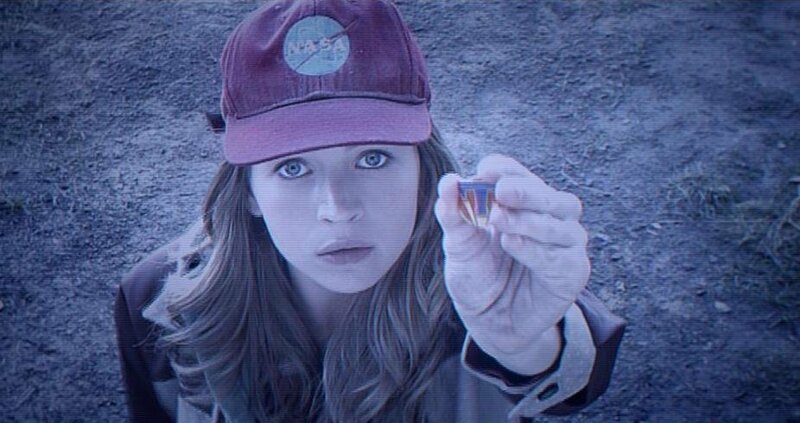 The most – and maybe only – intriguing part of Tomorrowland comes in the shape of the robot Athena (Raffey Cassidy). She’s sweet and irresistibly strong, with an incredibly nuanced performance by the youngster Cassidy. She deftly handles her action sequences and stands her ground against Clooney, one of the strongest actors of his generation. It’s baffling to me that she was only 12 years old during shooting. TWELVE. She’s a star in the making. 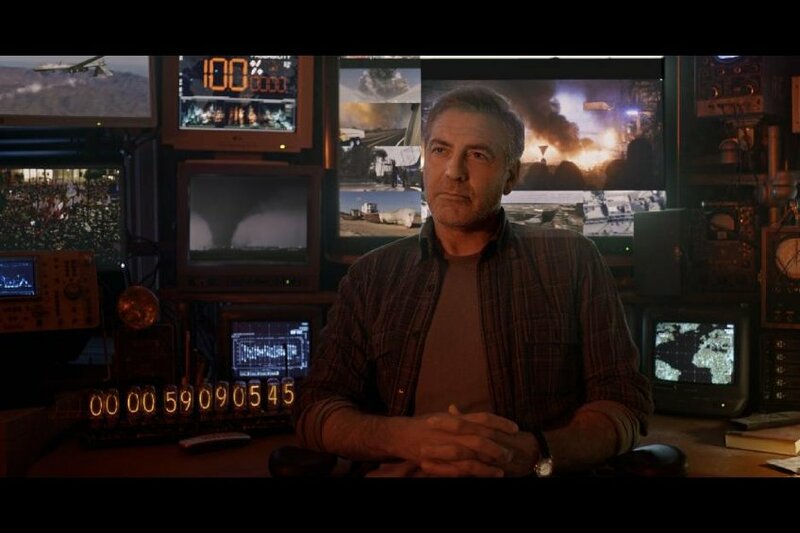 As for Clooney, this is a glimpse of the actor he is going to become. You can’t be the heart-throb forever, even though at 54 he hasn’t lost his boyish charm. This is him playing his own age, and even though his character becomes creepy with a borderline pedophilic subplot concerning Athena (you’ll see what I mean), he’s able to make his curmudgeon endearing. Robertson’s talent doesn’t get center stage as Casey though. She’s sold as smart and creative, but probably 75% of her lines are wasted on asking questions. It’s all exposition, and had Bird and Lindelof tweaked the script, the questions could have been brought up and answered through a suitable prologue that properly laid out the background and path of the story. Bird does some solid work here despite the overall letdown of the film. It feels like his own boyhood, injecting creativity into inspirations from his youth such as the World’s Fair and Disneyland. However, after seeing this, I’ll have a hard time going into another one of Damon Lindelof’s projects without a grain of salt. All you need to see is a two-minute interview to realize how smart he is, how well he knows cinema’s history and the process of moviemaking. But the guy just can’t write a cohesive story. 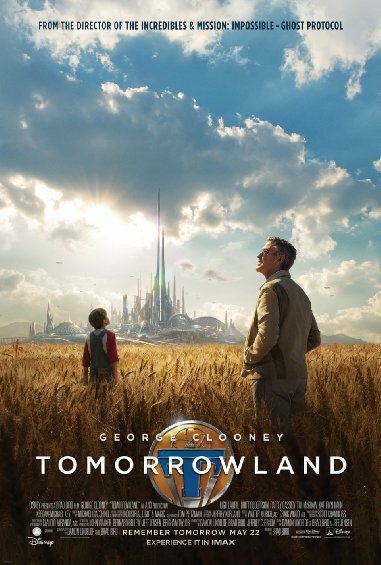 Tomorrowland, in all honesty, is composed of the same ten minutes worth of material shot twenty different ways. The dialogue is stiff and repetitive, copying and pasting itself, and the place and scene rarely have any influence on the story’s trajectory. And don’t get me started on Hugh Laurie’s “antagonist,” who is one of the most shallow and poorly thought out baddies I’ve seen in some time. This could have been, and I prayed it would be, an inspiration to kids to not fear creativity. To be innovative and thoughtful and kind. 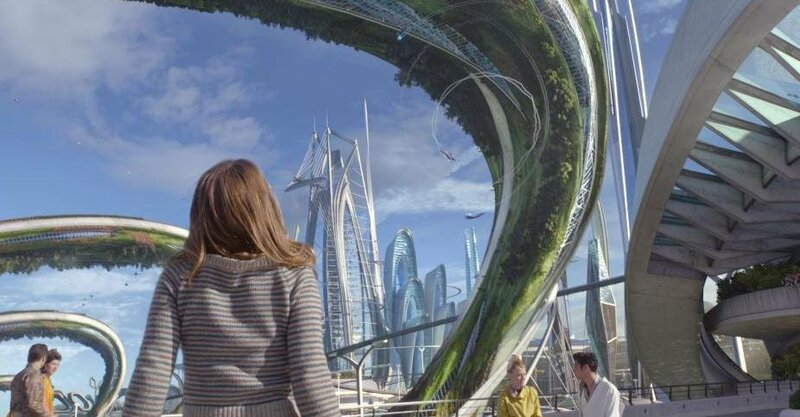 The terrible ending doesn’t tolerate that childlike hope, and says not everyone deserves or gets to see the limitless and selective place that is Tomorrowland. In a movie this disingenuous, the kids are better off in the endless scapes of their own imaginations. With each successive movie blogger I see posting about this, what little excitement I had about this wanes. All style and no substance? Good thoughts Logan.